What I would like to express, though, is my utmost gratitude to those whom, without their dedication, sacrifice and support, would render a project of this magnitude little more than a mere pipe-dream. The volunteers, the speakers, the vendors who took a chance on a fledgling symposium…to all of you, my heartfelt thanks and utmost gratitude for comprising the grassroots, heart-and-soul of this movement! And now we turn our Paleo movement attention to Denver, Colorado. This fall (October, to be precise), we’ll have the first Paleo f(x) satellite symposium. Onward and upward. Takin’ it to the masses, my friends. And growing this movement one symposium at a time. Stay tuned for details. What activities lay at the intersection of strength and play? Interesting question. For me, things like sprinting and basic bar work come to mind. Rope climbing, jumps, balls-out fixie riding. One of my favorite “workouts” combines riding my fixed-speed as fast as possible through the streets of Austin to the University of Texas’ Clark field, reeling off a series of interval sprints, then hitting a combination of bar muscle-ups and box jump-overs. Followed, of course, by the fixie huck back to home base — the Efficient Exercise Rosedale studio. “Play” and “exercise”, of course, lay along points on a sliding scale. One person’s “play” being another’s “thrashing”; someone’s “exercise” being another’s unattainable physical accomplishment. The point being that play and exercise ought to be interspersed so as to encourage optimum health. Unless, of course, we choose to divorce ourselves from the pursuit of “health”, and push the envelope toward “performance”. A typical week for me might look something like 2 ball-busting exercise sessions, 4 “play-outs”, and 1 sloth-fest. Skyler Tanner and friends — playing at this year’s Paleo f(x). Photo by Jolly. Challenges are another fun way to remain engaged in the physical culture scene; encouraging hard work without the practitioner even realizing it. Isn’t this what kids do naturally? Unfortunately, most of us “grow out of” this phase of life. And what we “grow in to” is a zoo-like existence of little fun and too much rigor and formulation. And very little, if any, play…much less, effective exercise. For instance, Skyler and I are still playing with the idea of trying to hit 10, full ROM Russian leg curls. I’ve worked my way up from 5 to 9 reps, with a 1-board spot. Once I finally hit 10 with at the single board level, I’ll move on to attempting 10 of the real McCoy version. And hell, you can “play” indoors as well. 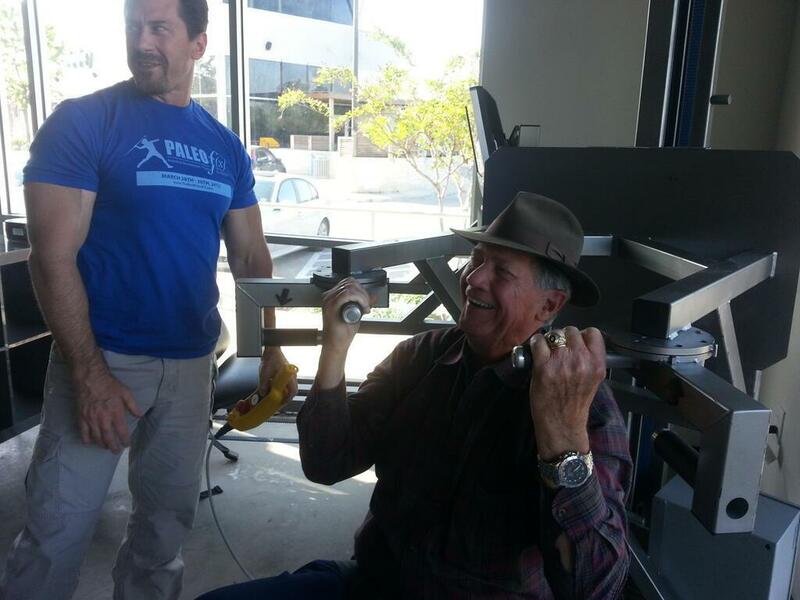 Below is a picture of me messing around with my pops on the ARXFit vertical at Efficient Exercise’s new San Antonio studio. Now, I can tell he’s playing, because the hat is still on. When he tosses that bad-boy aside, watch out — things are about to get serious. Dude, I don’t know how the hell you are getting those damn leans. I keep jimmy rigging my set up, and maybe I’m giving up some leverage…..should’ve made it to a EE studio to try on that set up. 1 arm chin, ironically, we discussed at paleoFX….then I decided to put it into a workout with the “non working” hand holding an elastic band with the intention of pulling on it as minimally as possible–when I sorta shocked myself in that I was using it pretty damn minimally. So….if I just add a little bit of targeted training, maybe I’ll get that 1 arm chin and redeem my weak sauce russian leans! 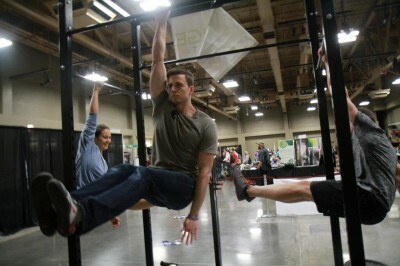 Long one-arm chin eccentrics + archer chin ups on rings are the way to go in my opinion. I’m 6’6″ 230 lbs and finally have a OAC on my dominant hand and really close on my non-dominant. You can totally do it if you put your mind to it! Great post Keith! Yep, Skyler wrecked me with those damn archer chins as well! Those are seriously difficult! Fortunately(? ), I am old enough that I can gracefully decline such challenges in the interest of sparing my already beat up shoulders and elbows. I do find the demonstrations of upper body strength by the BarStarzz and Bar-Barian crews to be quite impressive on occasion. Hannibal for King is particularly impressive.